This post may get lengthy, and will contain a bunch of pictures. That is the way it goes, when you are giving a photo tour. Click continue reading to see the tour. I also wanted to get this out earlier, but it is better late than never. Let’s start with navigational aids. In every elevator lobby there is a sign with the ship map, and a little you are hear dot. Here is my one fun fact about these signs. On a single sign, “Jogging Track” is spelled with an upside down “i”. Can you find that sign? Do you know where it is? I’m starting on deck 3, because decks 1 is not accessible to passengers, and deck 2 is all staterooms. So, not much to see below deck 3. Moving on, here is the grand foyer itself. It is a nice area, but not impressive. This is a big contrast from this cruise to our trip on the Disney Wonder. 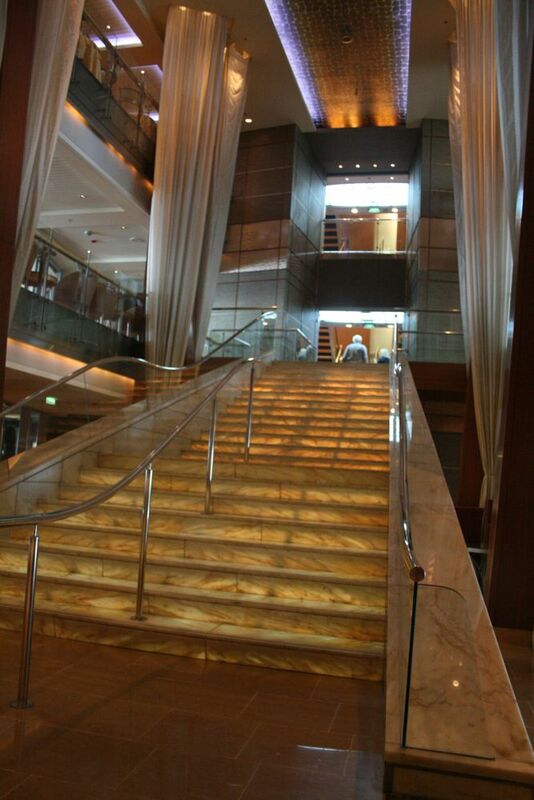 On the Wonder, you enter the ship through the grand foyer, giving you an instant impression of the ship. We didn’t enter there on the Infinity. We boarded on deck 4, right by a different staircase and elevator. This view is from deck 3 looking up. Right near the foyer area is the S.S. United States restaurant. The S.S. United States was an actual steam ship (now in holding in a ship yard on the east coast). The restaurant is themed after the ship. We did eat there one night… and the food and service (wow! what service!) are amazing. Place settings from the actual S.S. United States. Let’s see. How about we go up to deck 4 and head outside? On the Infinity, the promenade deck is not a true promenade deck (you can’t walk in a full circle), but is just fine. We weren’t out there too much, you know, because it was Alaska and not exactly sunbathing weather. The shops were a little crazy. Lots of stuff that we weren’t interested in. Lots of cheap crap… I was a little surprised about that. Apparently, the Infinity also has the only Coach store at sea, so if you want a purse on your cruise. The main dining room (the Trellis), is a two story, and quite large, dining room. We were on the upper level, but not really near this part. We were in the back, near the entrance. It turns out that this was a great spot. It was pretty quiet, and allowed us to have good conversations at our table. And, since we spent a good bit of time there… I have to include a picture of Martini Bar. The 8:30 dinner time left for some time to kill on a few nights. We spent this time in the Martini Bar, enjoying some yummy drinks. 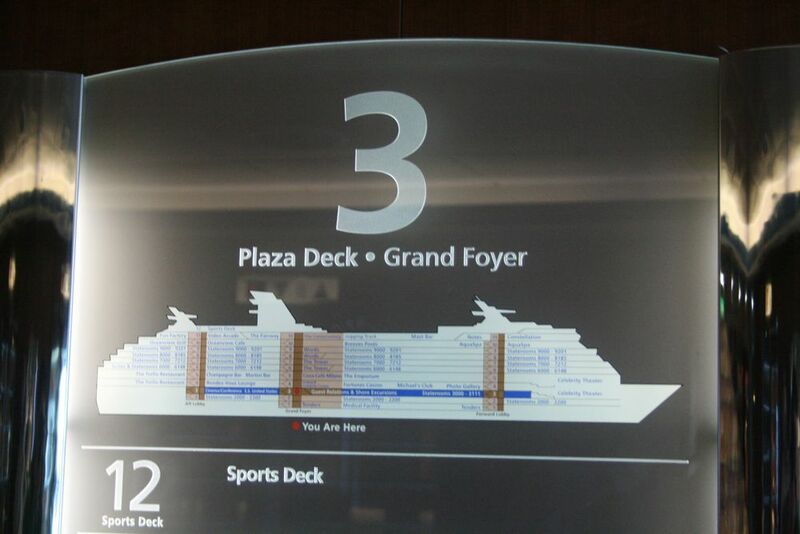 Decks 6, 7, 8, and 9 are primarily staterooms. The library is in there, but we didn’t take any pictures. So, on to deck 10. This is where the pool, spa and buffet all reside. The pool seemed very nice, but we didn’t partake. Of course, there is the spa area. We did enjoy this area of the ship. Here is the indoor, saltwater pool. There are two hot-tubs here, and behind this wall is the spa, salon, and gym. I have to include a buffet picture. Here is a great picture of the Sushi bar (that Cortny took). The buffet is huge. The first full day of the cruise, we actually ate in the main dining room for lunch because there were too many choices at the Buffet. Everything we had was pretty good. And, up on deck 11 there is a jogging track. I actually used the jogging track once, but did the rest of my workouts in the gym, where the cold Alaskan air wasn’t trying to blow me off of the ship. This is just a sampling of the pictures, all of the pictures are available on picasaweb. A tour of the Celebrity Infinity. And, I will be back soon with photos from our galley tour. Thanks for sharing the pics! It heightens my anticipation of our upcoming cruise to Alaska.